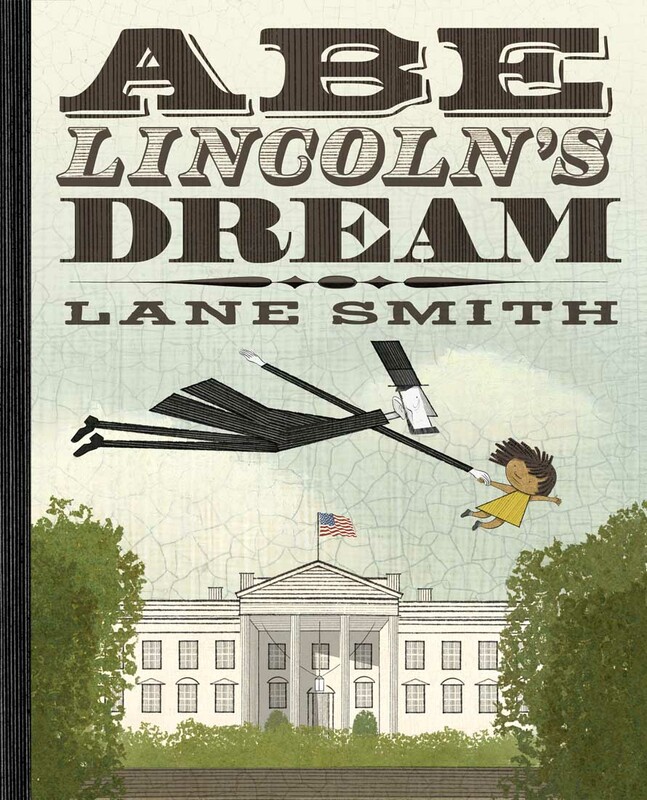 Lane Smith’s Abe Lincoln’s Dream invites us, with America’s 16th president, to travel through dreams and corny jokes, and to consider the state of the nation. 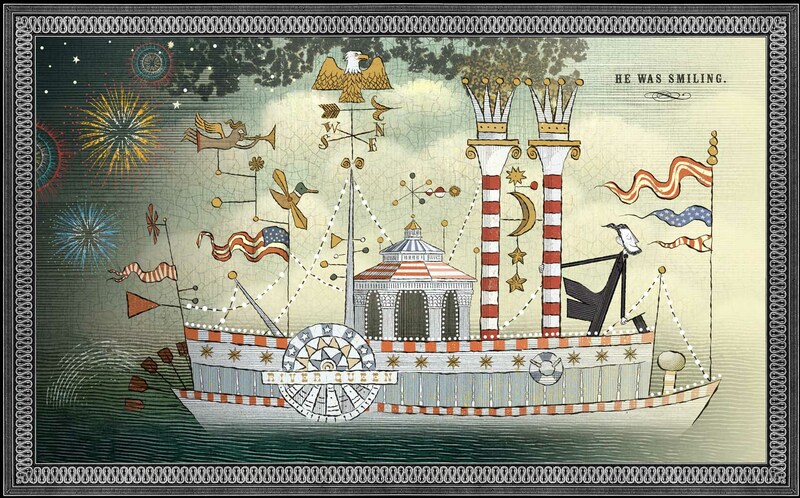 In a tone that falls between the humor of his John, Paul, George and Ben (2006) and the reflective mood of the Caldecott-Honor Grandpa Green (2011), Smith’s latest picture book imagines an encounter between President Lincoln’s restless ghost and Quincy, a girl who has strayed from her White House tour group. It’s a visually absorbing, gentle story in which good (and bad) humor stave off melancholy, and which encourages readers to reflect on American history. “Encourages” may be too strong a word. It’s more that the book’s subtlety grants us the space to reflect. Quincy shares her first name with the middle name of America’s 6th president, John Quincy Adams, who, in his post-presidential career fought against slavery. She resembles an older version of the African-American girl from Smith’s The Big Pets (1991). But the book never mentions her race, Adams, nor his politics. Nor that a two-page spread of Lincoln strolling through roses may allude to both the Rose Garden and the variety of flower known as the Lincoln Rose. However, the accretion of these details and others grant the book a visual richness that invites re-reading. Heck, the book is even typographically engaging. Abe Lincoln’s Dream’s layout recalls broadsides, with lines of text in alternating sizes, some in all capitals. Miraculously, designer Molly Leach has created this broadside look without sacrificing readability. There’s also something in these rectangles of text that echoes two other recurring rectangles: Lincoln’s stovepipe hat, and his long legs. In Smith’s rendering, Lincoln’s limbs are absurdly long and sharply angular — features that are both comic and accurate. (Lincoln was 6′ 4″.) 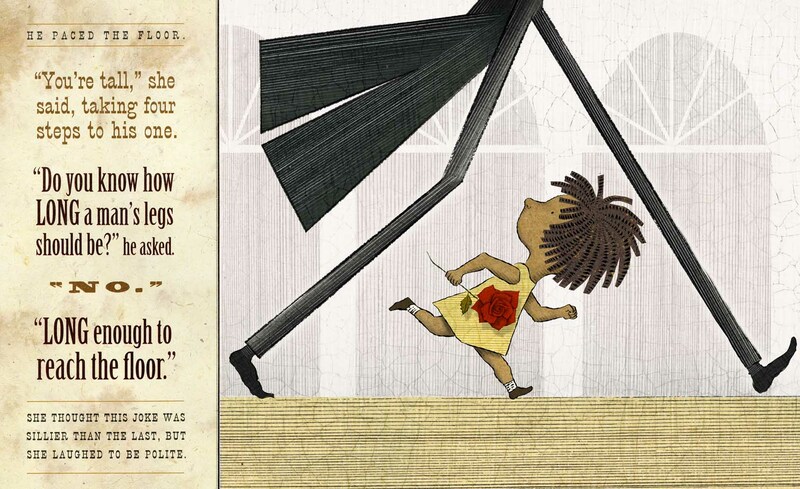 These images also reflect a child’s perspective on an adult: as a giant pair of legs that towers over her. Smith introduces this motif in the book’s opening pages, when three different presidential dogs get spooked by Lincoln’s ghost. FDR’s Fala ends up below a framed pair of legs (in the lower part of a portrait), LBJ’s Yuki approaches a pair of legs (LBJ’s) that extend up and off the page, and Reagan’s Rex cowers near table legs. In response, Quincy tells him that “A lot has changed since 1865.” Then, Lincoln’s ghost takes her hand and they fly up above the White House. As Smith’s narrator explains, “The ghost did the flying. 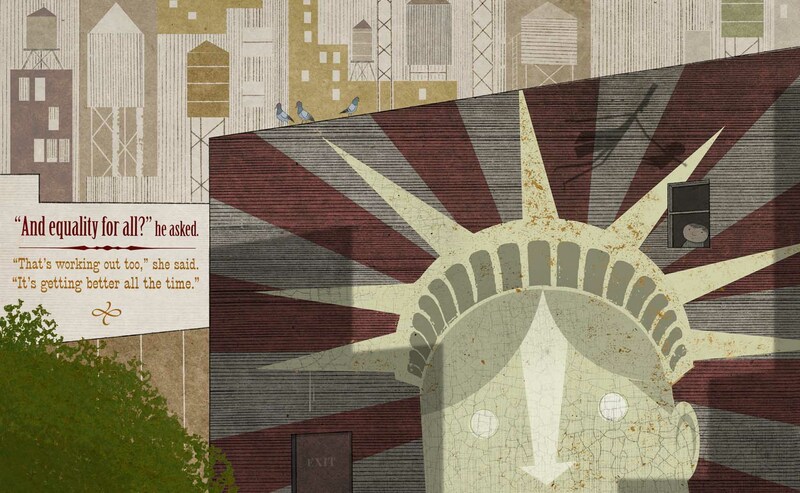 The girl answered the questions.” While they soar above the Capitol, past a mural of the Statue of Liberty (and other places), she tells him that things have improved since then. Her words share the page with images that do and do not support her optimism, though the book itself ultimately gestures towards a better future. When you’re living in a country reluctant to face climate change, its wars, economic inequality, or its crumbing infrastructure, it’s a daily challenge to find hope. Though Abe Lincoln’s Dream doesn’t explicitly address these issues (and there’s no reason it should), its conclusion supplies the hope that all political change requires, and that children seem to possess in greater quantities than adults. The night after her visit, Quincy dreams of “a tall man in black, on a boat moving rapidly toward the rising sun.” On the next (and final) pages, there he is, standing towards the prow of a patriotic steamboat, smiling as he faces the future. Here’s hoping that Quincy’s dream comes true.